This superb itinerary really does show off India at its best from its unique and exciting wildlife to its vibrant and colourful culture and history, all the while, travelling through varied and amazing landscapes. 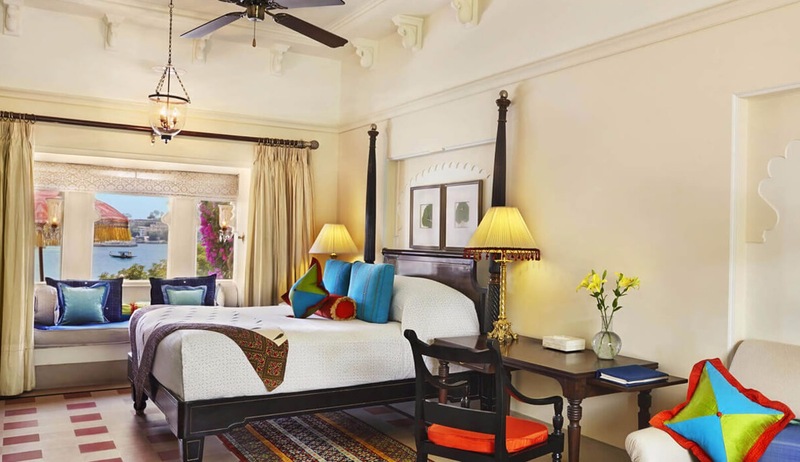 Marvel at the Taj Mahal and the Pink City of Jaipur and track tigers in the wild, each day returning to your luxury hotel, where no comfort is too much. A truly memorable experience. Speak to someone who’s been to India. Start planning your tailor-made trip by calling one of our friendly destination specialists on 0800 195 3385 or 44 1625 581143 for outside the UK. Arrive at Delhi International Airport. Met and transferred in private car to the Imperial Hotel for overnight stay on full board basis. 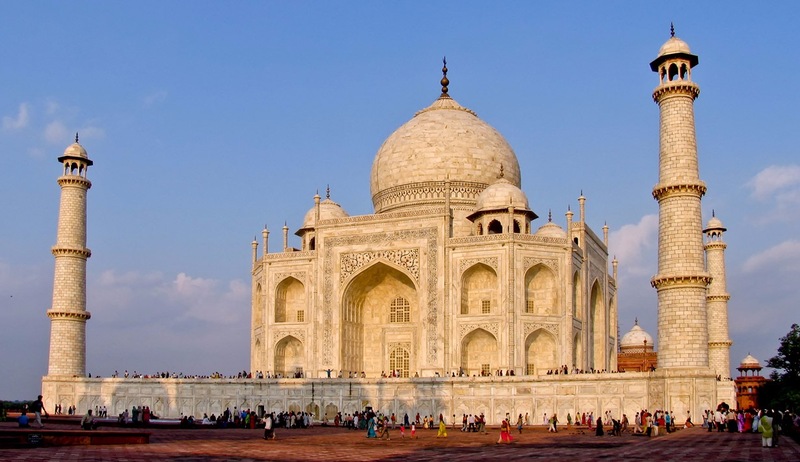 In the afternoon, take a guided sightseeing tour of this vibrant city, taking in the President's House, India Gate, Humayun's Tomb, Qutab Minar and the Mahatma Gandhi Memorial. Collected in the morning and transferred in private car to airport for flight to Udaipur arriving at 9.40 am. 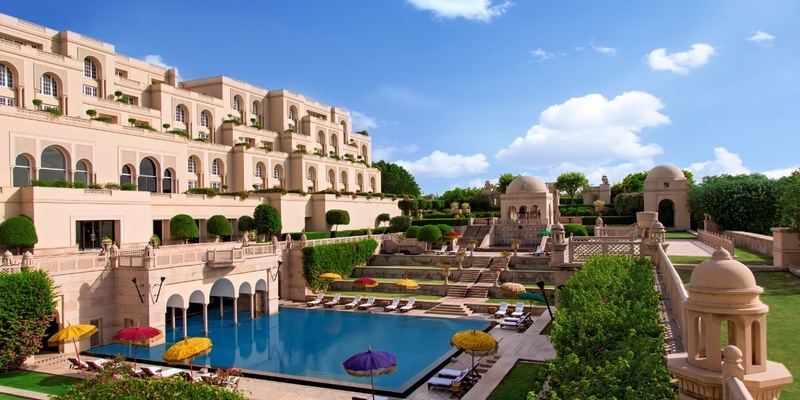 Met upon arrival and transferred by private car to the Oberoi Udaivilas Hotel for two nights on full board basis. Afternoon guided tour of this beautiful city, including the City Palace, Jagdish Temple and Sahelion-ki-Bari. Day 3 will be a full day at leisure, with your car and driver at your disposal. Collected in the morning by private car and taken to airport for flight to Jaipur, arriving at 10.45 am. Met on arrival and transferred by private car to Oberoi Rajvilas Hotel for two nights on full board basis. Afternoon guided tour of this beautiful pink city including the City Palace, Hawa Mahal and Jantar Mantar astronomical observatory. On day 5 take a morning guided tour to the Amber Fort. Afternoon at leisure. 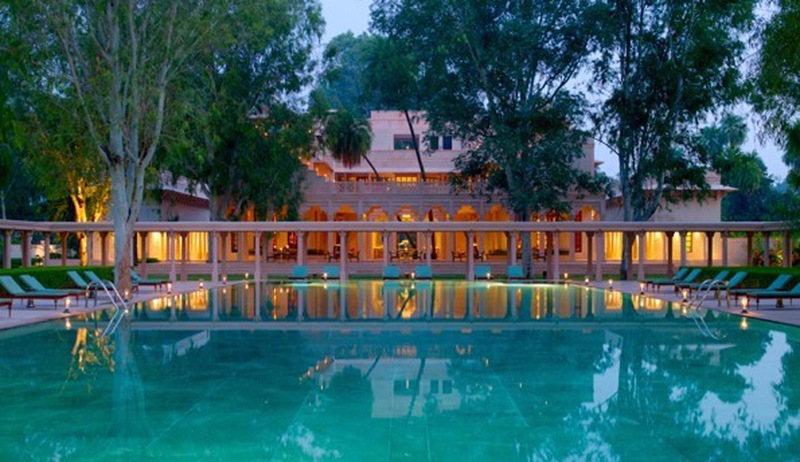 Travel by road from Jaipur to Ranthambore National Park and the Oberoi Vanyavilas for three nights on full board basis. In the afternoon take your first jeep safari into the park. 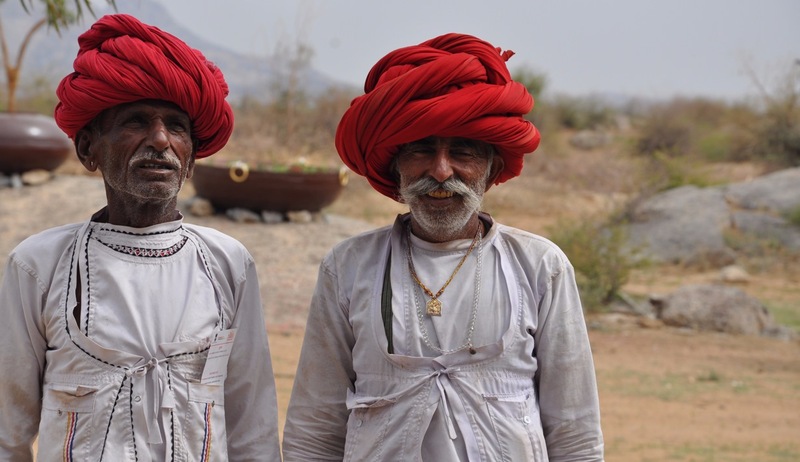 Rathambore is rich in history with ancient ruins and temples, set in wooded, marshy and lake-land countryside. 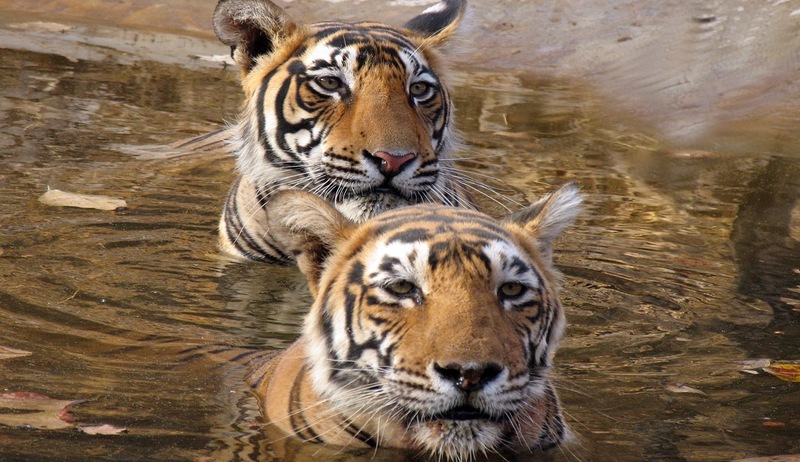 Once the hunting grounds of the Maharajahs of Jaipur and later the British, Ranthambore National Park was declared a wildlife sanctuary in 1955. 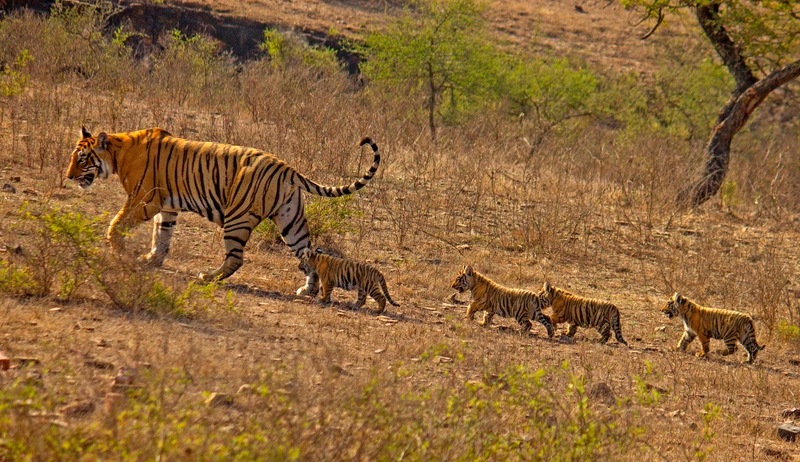 The wildlife, including the tiger population, is thankfully flourishing so the Indian government have decided to increase the national park to encompass a range of hills close to Ranthambore to ensure the Tiger populations have the space to grow. Expect to see tiger, sloth bear, mongoose, samber, cheetal, langur monkeys and if you are lucky also leopard, hyena, jackal and marsh crocodile. Excellent birding opportunities including paradise flycatcher, serpent eagle, jacana, painted stork, Bonellis eagle, horned owl, grey partridge, white necked stork, king vulture, ring dove, golden backed woodpecker and many more. Morning and afternoon jeep safaris into the park on days 7 and 8. Whilst here don't miss the opportunity to visit the fort which is a wonderful backdrop to the majestic landscape and its many lakes. After breakfast, collected by private car for the three hour drive to Ajabgarh and to the Amanbagh Resort for two nights on full board basis. Ajabgarh is a picturesque garrison fort between Bhangarh and Pratapgarh, with a lovely reservoir nearby. Ajabgarh fort was built by Ajab Singh Rajawat, The grandson of Madho Singh. The fort is in good condition, and offers an incredible panoramic view of the eponymous walled town and the well–preserved, but less visited temple of Shri Raghunath which is nearby. 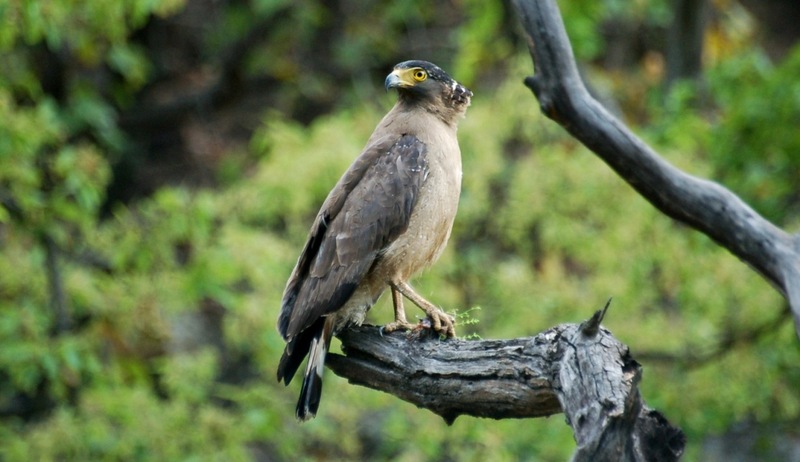 There is an option here for a birding tour into Sarika National Park. 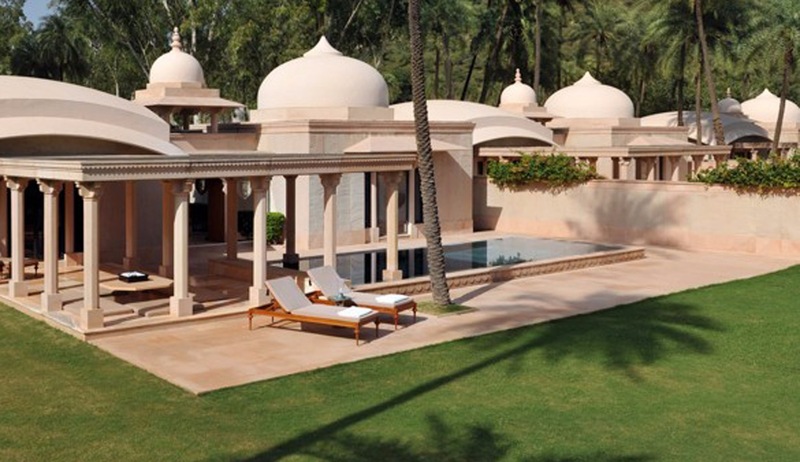 After a leisurely breakfast, drive by private car to Agra via the ancient Mughal capital of Fatehpur Sikri, and on to the Oberoi Amarvilas Hotel for overnight stay on full board basis. Up early this morning for a guided visit to the Taj Mahal at dawn to experience the magic of sunrise over this graceful monument to love. Later in the morning drive to Delhi and to the Imperial Hotel for an overnight stay. On day 13 you will be transferred to airport for onward or return travel. Breakfast in included on this day. 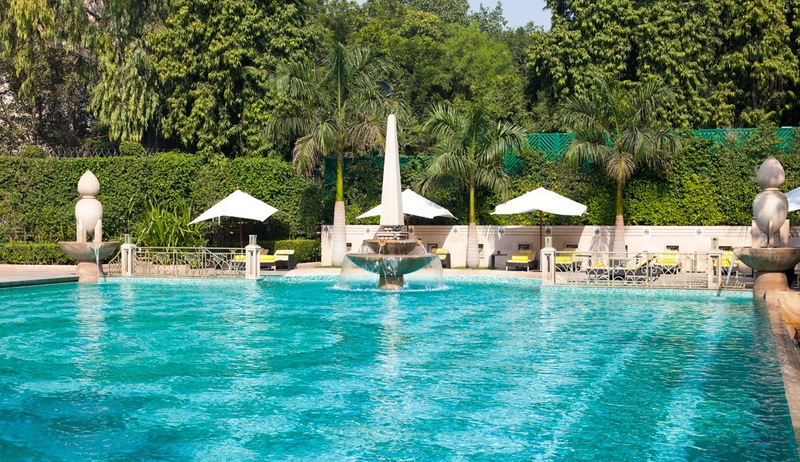 The Oberoi Amarvilas is one of the finest hotels in Agra, located in an unrivalled position, just 600 metres from the iconic Taj Mahal. Each room has uninterrupted views of this ancient monument. The hotel is approached along a sweeping driveway, verdant with native trees and lit by flaming torches. Just inside, a Mughal style quadrant is ornamented with cascading fountains and framed by an arched passageway and gold leaf frescoes. 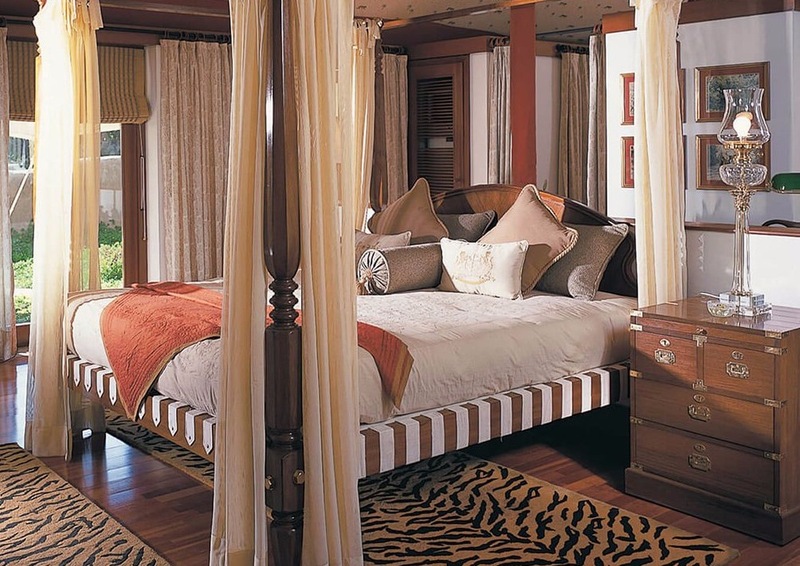 By day, guests can travel in private golf buggies to the Taj Mahal. At night, they can savour a candlelit dinner beside its soft silhouette. 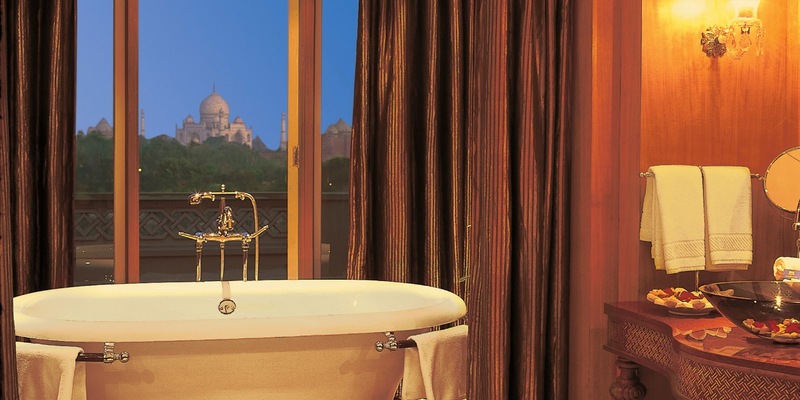 A selection of suites, each lavishly furnished with all facilities and a view of the Taj Mahal. Restaurants and bars, including al fresco options and in-suite balcony dining. Spa, gym and large outdoor pool set in terraced gardens. Full concierge services. Wifi in all rooms. 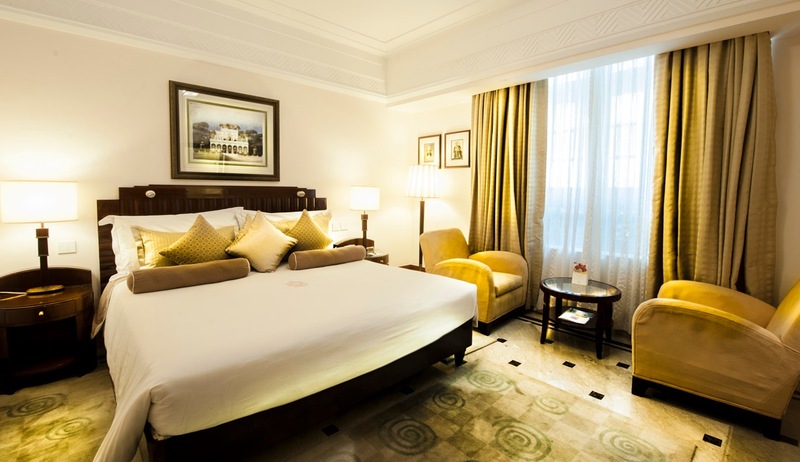 An established, luxury hotel, well located in the centre of New Delhi, close to Connaught Place and the city metro. 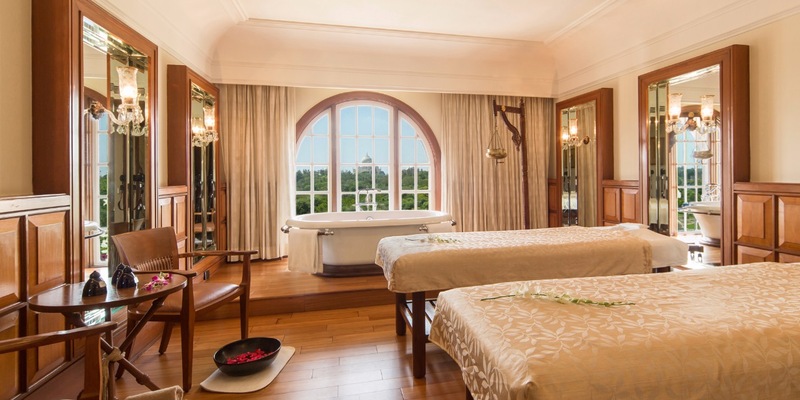 The hotel was ranked as Best Luxury Hotel in India 2010-2012 and maintains that standard. 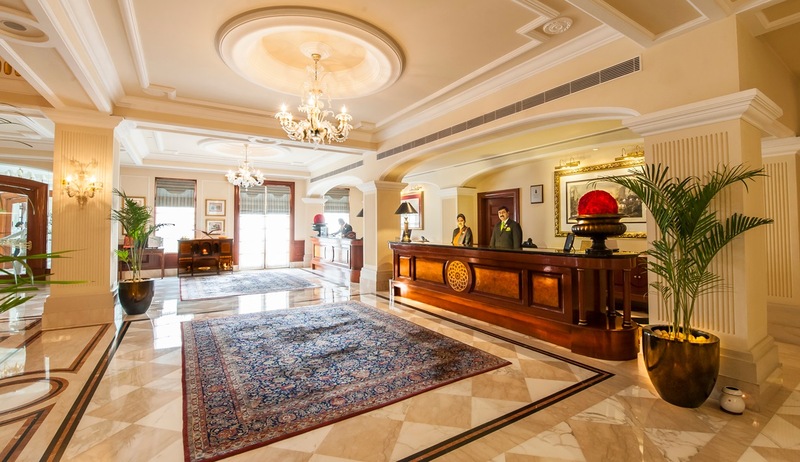 235 rooms and suites, each with ipod dock, TV, safe, minibar, tea/coffee making facilities, newspaper and luxury bathroom products. 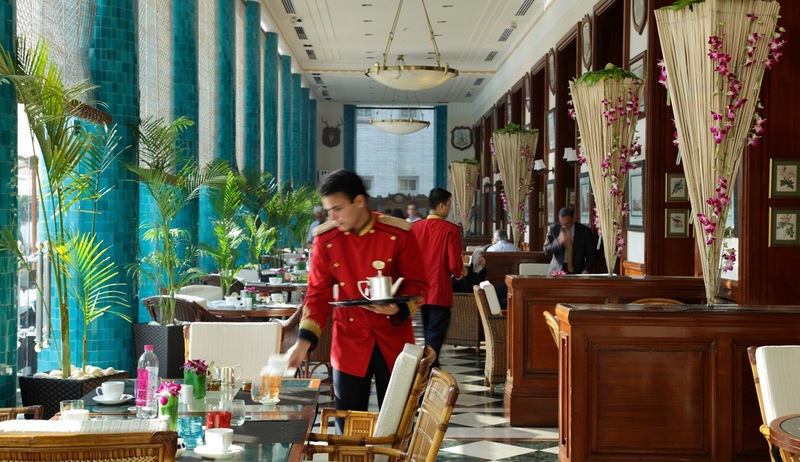 Several restaurants with Indian, Asian, French, Italian cuisine plus afternoon tea and bars. 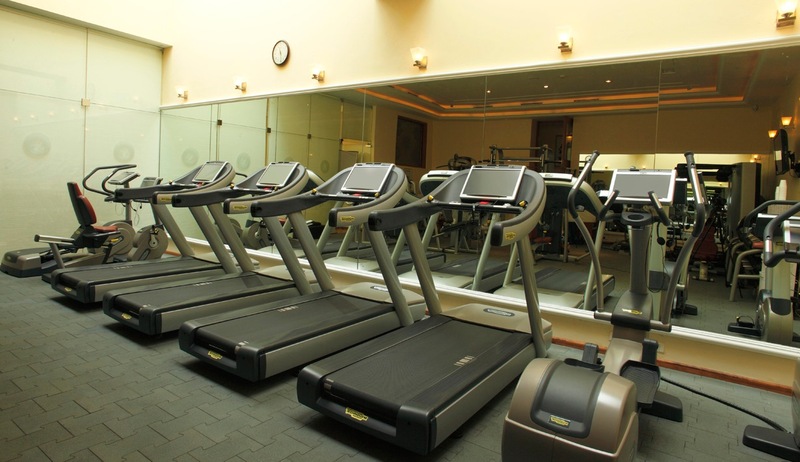 Spa, hamman, sauna, Jacuzzi, fitness centre and outdoor pool. Full concierge facilities. 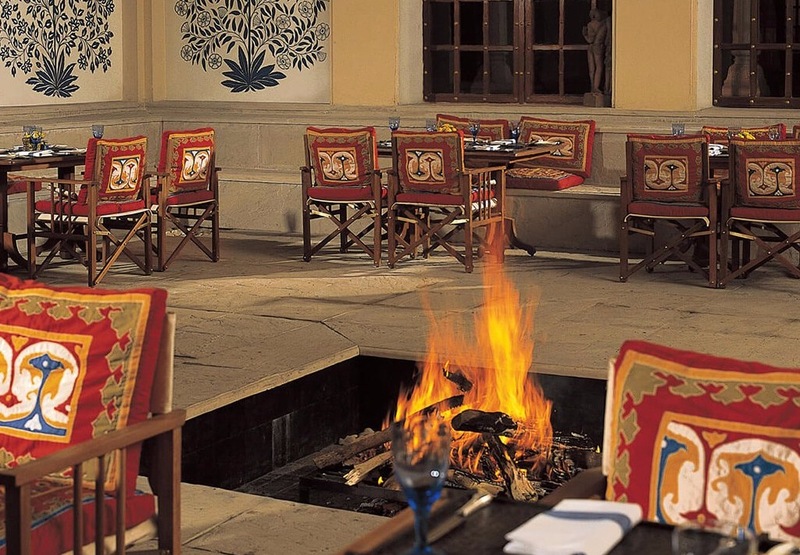 Located on the bank of Lake Pichola, The Oberoi, Udaivilas is unique amongst luxury hotels in Udaipur. 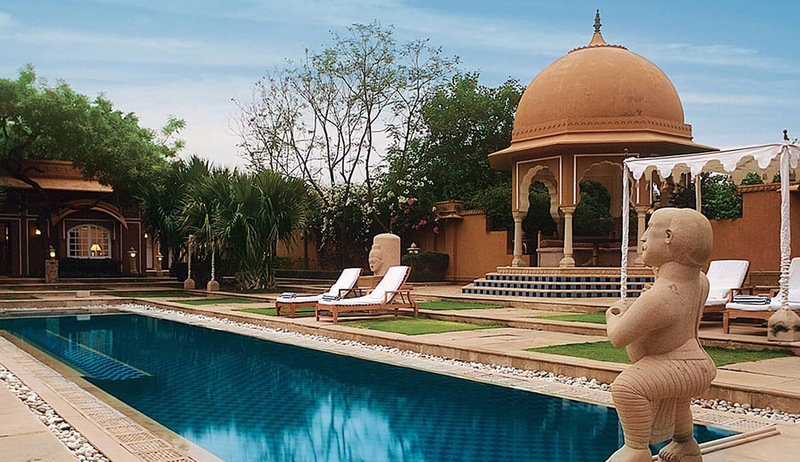 It stands on the 200 year old hunting grounds of the Maharana of Mewar and is spread over fifty acres, which includes a twenty-acre wildlife sanctuary with deer and wild boar. 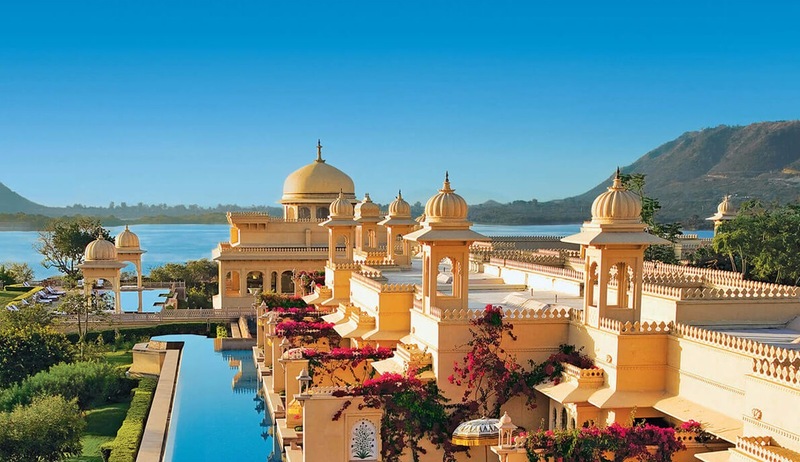 The Oberoi Udaivilas, Udaipur also affords spectacular views across the hotel's verdant gardens and sparkling Lake Pichola. 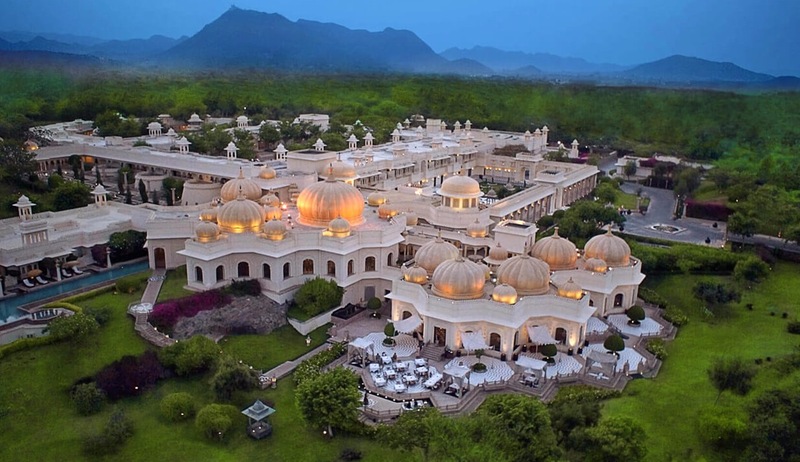 This luxury hotel in Udaipur has an intricate layout of interconnecting domes and corridors that reflect the layout of Udaipur itself; whose seven lakes are linked by canals. These domes and walkways are flooded with sunlight, caressed by balmy breezes and offer magnificent views of the lake and gardens. 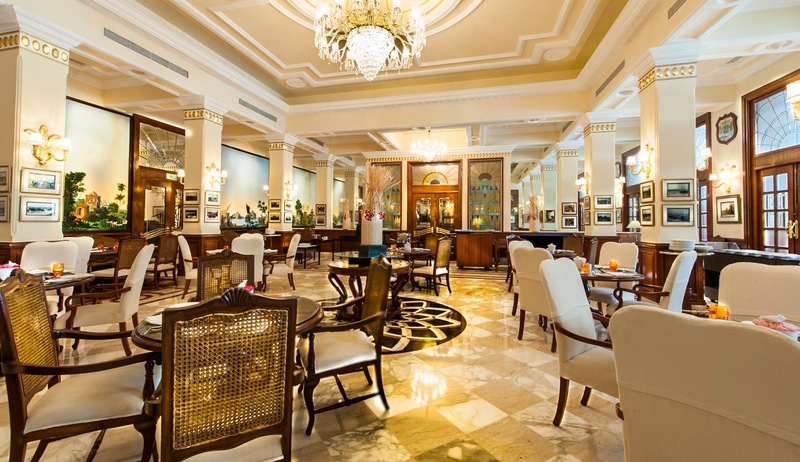 This truly is a luxury hotel with all the facilities and services that can be expected. 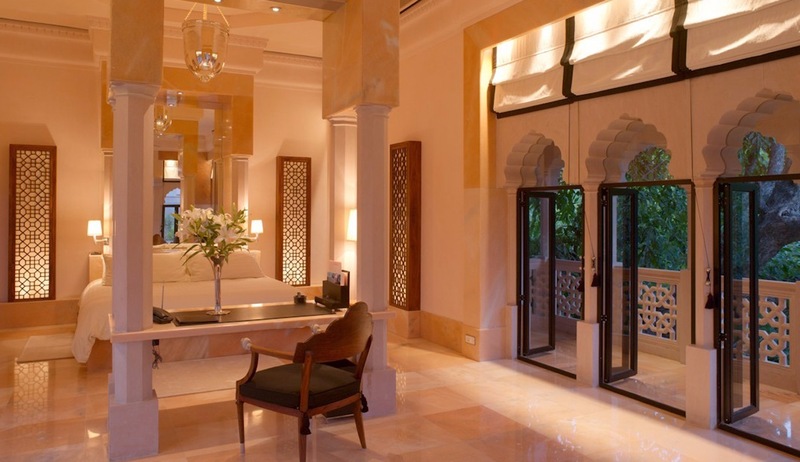 There is a range of suites and rooms, all en-suite and with air-conditioning. 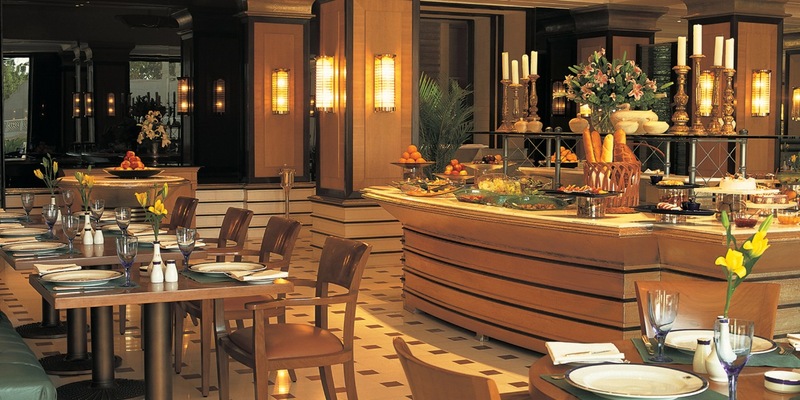 The hotel has a number of eating options along with spa and pool. 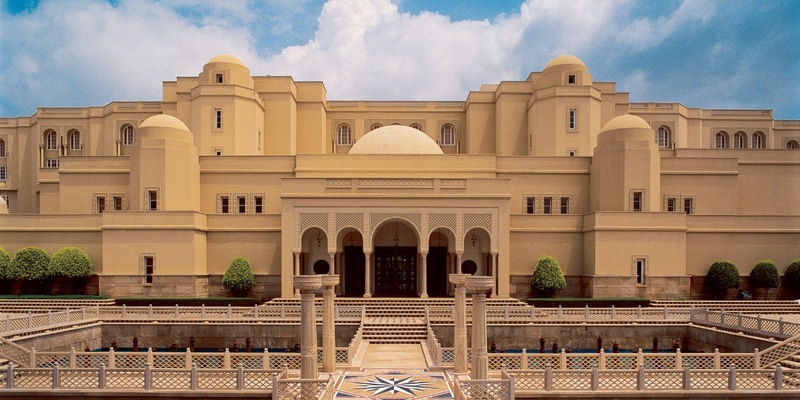 Throughout our luxury resort in Jaipur, traditional techniques have been used to replicate the famous pink lime plaster walls of the historic city. 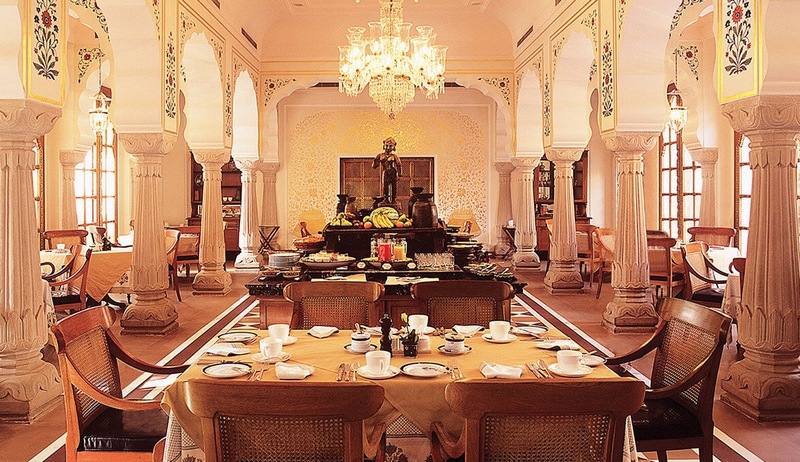 Also adorned with Mughal arches, gold leaf frescoes, high domed ceilings and magnificent crystal chandeliers, The Oberoi Rajvilas, Jaipur epitomises traditional Rajasthani charm and Oberoi five star luxury. Rooms are laid out in small clusters that afford privacy for couples, and convenience for families or small groups wishing to stay near one another. Each cluster unfolds onto a courtyard crowned with a traditional fountain and framed by natural canopies abundant with native flowers.Spread over thirty two acres, rooms can be reached on foot or in a golf buggy. Rooms are furnished with a king size bed, handwoven rugs, ornate wooden dressers and decorated with natural fabrics in neutral colours There are three indoor restaurants and opportunities for al fresco dining for brekfast and dinner. There is a spa and pool. 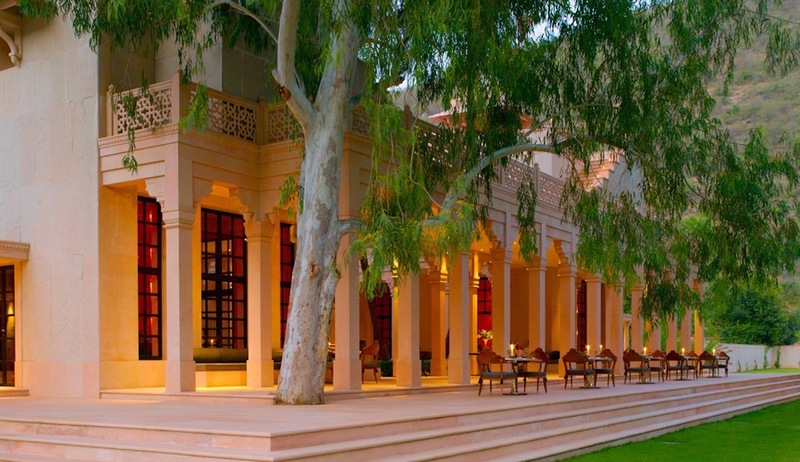 Located less than 10 minutes from the entrance to Ranthambore, the Oberoi Vanyavilas offers guests a 5 star luxury base from which to explore the National Park. The resort is set in twenty acres of lush, landscaped gardens, with an observation tower, from where guests can look out over the surrounding jungle and hills beyond, and a small lake - a great place to look for wildlife whilst enjoying an evening drink. 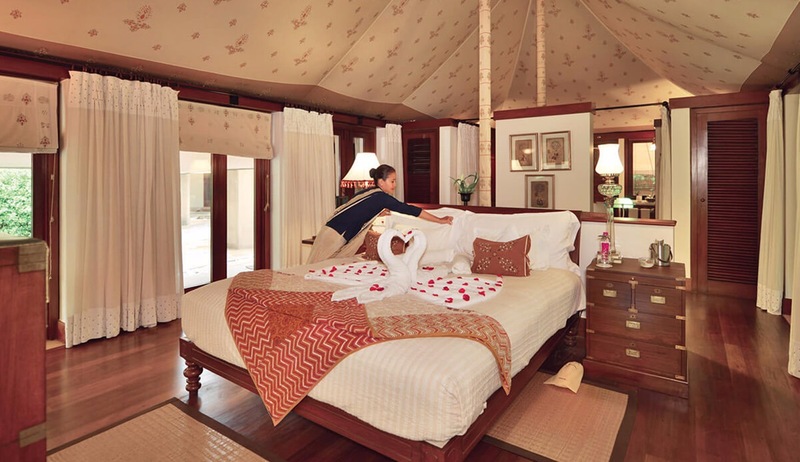 Accommodation is in luxury climate controlled, triple canopied tents, with four-poster bed, free standing bathtub and a dedicated butler. Each tent has a well, stocked minibar, 32" TV, iPod docking station, DVD and CD player, high speed wi-fi and 100% silk bathrobes. 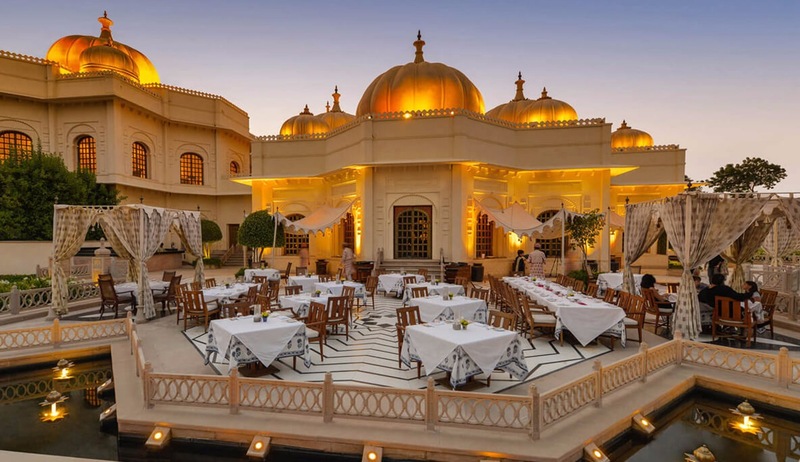 The tents are arranged to offer the maximum amount of privacy, whilst still being convenient to the swimming pool, spa and restaurant where guests can dine on Rajasthan specialities, Indian favourites and continental dishes. Private candelit dining is also available for those wanting a little more intimacy. Out of my 9 safaris I had amazing sightings in 8 of them, including some very close encounters as they strolled past only a few feet away from our jeep. The Tiger Den Hotel was also very nice and comfortable and I would highly recommend it to others. Although my main aim was to see tigers, which I did , it was the abundance of other wildlife and incredible birding that took me by surprise. The guiding was generally very good and the standard of accommodation much better than I was expecting. The food was fantastic throughout, especially as I’m a vegetarian. I think this trip represented great value for money and ticked so many boxes for me, I look forward to going back one day. 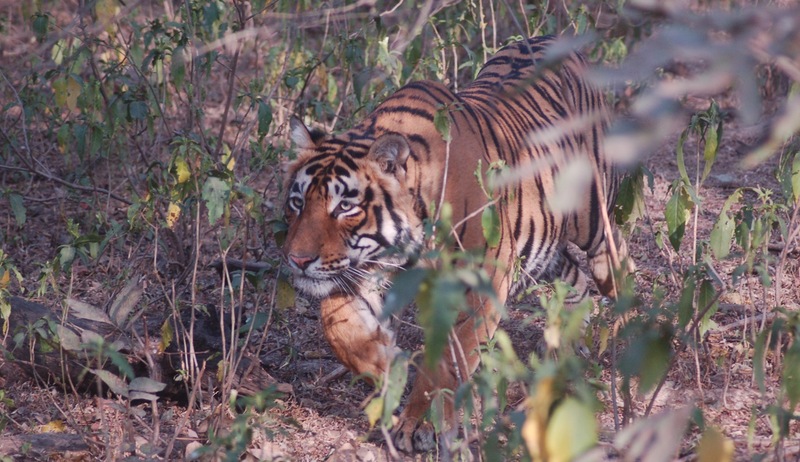 The thing I liked most about our itinerary was that it kept us away from the crowds, having been to India before I know how busy and over whelming it can be but with Sara’s help we were able to visit some of the less well known National Parks, yet didn’t compromise on the wildlife. We saw everything we wanted and more, rhino, leopard, lion, tiger, sloth bear and more birds than I care to remember. Thank you for a fantastic trip and we look forward to booking another wildlife adventure with you in the near future.